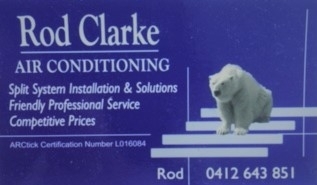 Rod is available for all your split system air conditioning needs. Whether its a new installation, service or breakdown, Rod has 17 years experience and provides a friendly professional service, free quotes and very competitive prices. Get your filters cleaned regularly to ensure the efficient running of your system. Servicing all areas of the Sunshine Coast.